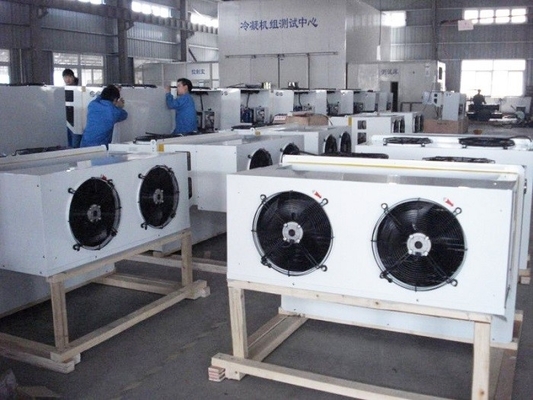 In order to adapt to market demand of cold room equipment , we designed Mono - blocks for cold room ( Integral cold room condensing unit ) . It can be widely applied in miniature cold room for temperature - 5 ℃ / 5℃ & - 15 ℃ / - 20 ℃ . Contact design , reduced the installation space . Tecumseh fully - proof compressor , high performance and reliability , low noise . Heat exchanger made from high performance inner grooved tube aluminum fins , high efficiency heat transfer . Famous refrigeration parts and fan motor , high reliability and long life . Full automatic intelligent electronic control , within temp Setting , temp Control , automatic electric defrosting etc . The units has a protection of over loading , sub - heating , pressure etc . New installation mode , It is simply to be installed to make a hole in the cold room wall and put the machine into the hole .